Milan - Italy coach Antonio Conte's decision to pick Brazilian-born Eder and Argentine-born Franco Vazquez in his squad has sparked a new row over 'oriundi' with former coach Marcello Lippi becoming the latest to join in. The Azzurri have routinely fielded oriundi, foreign-born citizens with Italian ancestry, over the years. Recent examples include Cristian Ledesma, Gabriel Paletta, Ezequiel Schelotto, Amauri, Thiago Motta and Romulo. Even so, the subject still causes controversy when new ones are selected. Lippi told Gazzetta dello Sport on Wednesday the reduced number of Italian players in Serie A left Conte with little choice. 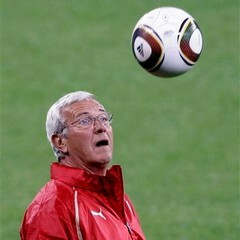 "We would like an Italy of Italians," said Lippi. "(But) if the coach can only select 34 percent of Serie A players and there are some who are important and play a particular role, then calling them up is the right thing to do even if they are oriundi. "In any case the rules allow it." Conte said he would continue calling up oriundi in the future and pointed out that more than one-tenth of players at last year's World Cup were born outside the country they represented. Inter Milan coach Roberto Mancini and Verona's Andrea Mandorlini have opposed the use of oriundi and polls conducted by La Repubblica and Gazzetta showed around 70 percent wanted only Italian-born players. Eder, who joined Empoli as an 18-year-old and is now with Sampdoria, said other countries were more open-minded about the use of foreign-born players. "There's a certain amount of prejudice in Italy," he told Diario Catarinense, a newspaper based in his home Brazilian state of Santa Catarina. "We see that Germany have players from other countries and the same goes for France with a number of Africans. "I think (the criticism) is nonsense," added Eder who said he wanted to follow in the footsteps of Argentine-born Mauro Camoranesi, a World Cup winner with Italy in 2006. "If I am half as successful as him I will be happy." Eder dismissed criticism he picked Italy because he had little chance of being selected by Brazil. "I know Italian football very well, I would not accept an invitation from just any national team," he said. "Anyone who knows about football knows how important Italy are." Conte's team visit Bulgaria for a Euro 2016 qualifier on Saturday before meeting England in a friendly in Turin three days later.